Free care for patients recovering from Ebola is being provided at Mangina Reference Health Centre, said Sister Yvette Kanyere, the facility manager. "At first we thought it was severe malaria, as we used to have here before. And, as you know, our health workers were the first to receive and examine the affected patients without personal protective equipment," explains Sister Darlène Mwasi. Since then, "we now have eight of our nurses infected; it's really sad," she adds. The occurrence of Ebola in the area has created a wave of concern among the population. "I have seen many people die here since the disease was reported, and we were told that these people had died of Ebola," says Athanase Ndungo Bonané, 67, a guard at the Mangina referral health centre for over 14 years. He watches over these hospitals day and night and regularly sees all kinds of patients arriving for basic health care. "Suddenly, I had a painful feeling that we were all going to die here," he confides in Kiswahili, one of the four most spoken official languages in all of eastern Democratic Republic of Congo. "In seeing these quick and effective health interventions, especially the Ebola vaccination, my friends in the neighbourhood and I have been relieved," said the energetic guard at the health centre. To remedy this situation, "a reasonable financial contribution will be provided as motivation," he stresses before indicating that other health workers from neighbouring health zones replace them during this period. These positive advances are welcomed by other health officials in the region. 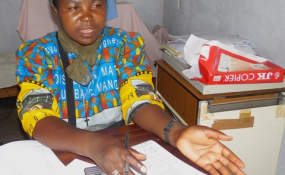 "This will help us to provide not only the free patient care, but also with rapid detection of cases in our health facilities," notes Musubao Tongo, a treating nurse who came from the nearby health zone of Oïcha with about fifty other colleagues to help out at the Mangina health centre. "You see a small village like that, which was not so known before, and suddenly, it becomes famous and the whole world is interested in it. It gives us hope that the epidemic will be controlled quickly to allow us to go about our normal business," said the nurse in a calm voice. She added: "This is the first time we have seen the national health minister, the WHO Director-General and the Regional Director for Africa here. Their visit and the start of vaccination for people at risk have kept us in good spirits."